Heat water and salt to boiling. Add fish; cover and simmer 6 to 10 minutes or until fish flakes easily with fork. Drain; reserve 1/2 cup broth. Break fillets into 2-inch pieces; keep warm while preparing sauce. Melt butter in saucepan; cook and stir onion in butter until tender. Stir in flour, curry powder, sugar, salt and ginger; cook over low heat, stirring until mixture is smooth and bubbly. Remove from heat. Stir in reserved broth and milk. Heat to boiling, stirring constantly. Boil and stir 1 minute. Stir in fish; heat through. 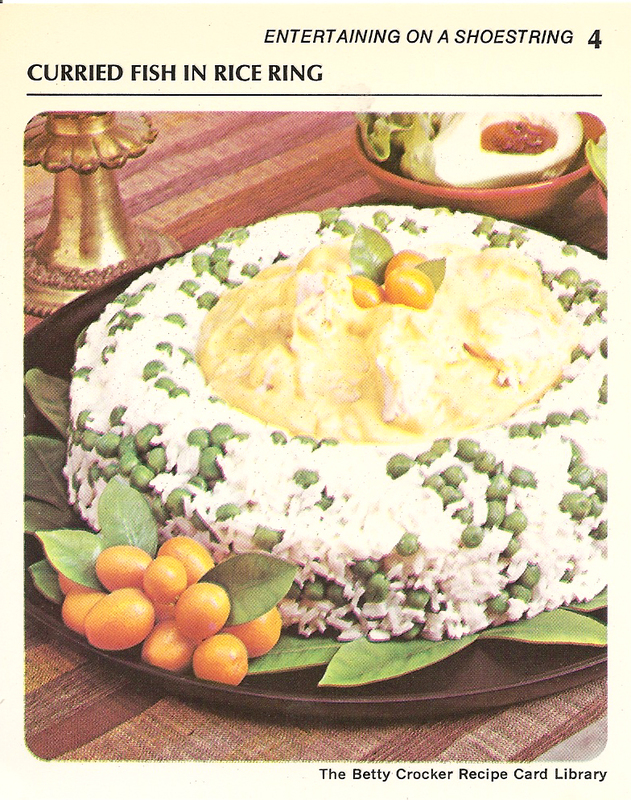 Mix rice and peas; pack lightly in greased 6-cup ring mold. Unmold on large serving dish; pour fish sauce into center of mold. 4 to 6 servings. A whisper of curry and a dash of ginger give distinction to the economical luncheon casserole.